Aqua watercolor mediums from Schmincke allow artists to create a wide range of unusual and exciting effects. The development of this line responds to the ever-evolving needs of contemporary artists who work in watercolor. Aqua mediums can be used alone or mixed together. However, Schmincke Aqua Mediums should not be mixed with paint in the pan. Mix with watercolor on a palette or paper. Fix — Aqua Fix can be mixed with watercolor paint in lieu of water or applied over a watercolor wash. It makes the surface waterproof and allows successive washes of color that do not disturb one another — colors remain clean and vibrant. This product has a slightly milky appearance but dries clear. Some artists have found it useful for application over watercolor painted on canvas in order to preserve and protect the surface. Wash brushes and palette immediately after using Aqua Fix. Masking Fluid, Blue — Blue tinted Aqua Masking Fluid is the same formulation as Aqua Colorless Masking Fluid. It will retain areas of white paper or areas of underpainting, then easily rubs off with finger or eraser. The handy dispensing bottle allows for fine detail work. Dry the surface thoroughly after applying and before painting with watercolours. Do not leave masking fluid longer than two days on the paper. It is also recommended for airbrush work. Pasto — Pasto is a thickening gel that increases the body of the paint, giving pleasing textural lines and adding extra gloss. It is best suited for use with tube watercolor. Mix it with the paint or use it pure by applying it in several layers with a spatula on the surface of the paper prior to painting. Pasto dries slowly, reduces the flow of color, and remains water soluble. Primer, Fine — Priming with this product transforms supports not usually used for watercolor — canvas, painting boards, wood — into suitable grounds for watercolor. This primer creates a soft and even surface that helps the smooth transition of one color into another, creating lovely effects. It is especially well suited for wet-into-wet application. The primer can be tinted with tube watercolor or acrylics. Apply at least 3 layers of primer on the surface with a brush, spatula or roller. The surface can be painted after the primer has completely dried. Oxgall — This is a natural wetting agent for degreasing of undercoats before painting with watercolors or gouache. It should be used sparingly, and is suitable as a leveling agent for watercolors. Oxgall tends to flocculate (form lumpy or fluffy masses) when stored over long periods of time. However, this does not effect the quality or application method of the product. Shine — This is a sparkling iridescent medium with a pearlized effect. It can be applied pure to dry paint, or mixed with watercolor to create beautiful tints. It remains water soluble, although dilution reduces the pearlescent quality. This medium has retarding qualities, slightly lengthening the drying time of colors. Highly effective in abstract or semi-abstract passages of a painting, it shows best over dark colors. Gloss — This medium increases the gloss and brilliance of watercolor. It can be applied over dried watercolor or mixed with color prior to painting. The gloss effect decreases when diluted with water. Aqua Gloss retards drying time and remains water soluble. Primer, Coarse — This primer creates a rough surface on surfaces such as canvas, wood, and board, and restricts the flow of color, resulting in a textured effect. This primer can be tinted with tube watercolor or acrylics. Apply at least 3 layers on the surface with a palette knife or spatula and allow it to dry completely before applying watercolor paint. Masking Fluid, Colorless — This removable, colorless fluid makes specific fields water resistant. It will retain areas of white paper or areas of underpainting that you want to reserve, and then can easily be rubbed off with finger or eraser. The handy dispensing bottle allows for fine detail work. Allow masking fluid to dry thoroughly before painting and do not leave masking fluid longer than two days on the paper. It is also recommended for airbrush use. Effect Spray — This spray medium disturbs the surface of watercolor paint and creates interesting patterns. It should be used on wet or damp watercolor for maximum impact. When applying the spray, areas of the painting that must remain white should be masked. Collage — Use Aqua Collage pure or mix it with watercolor on your painting. Then strew or press the elements you're using — for example, textiles, silk paper, pigments, sand — into the wet medium. 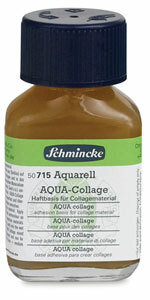 Aqua Collage is best suited to sticking lightweight collage materials to the support. It stays water-soluble. However, when mixed with Aqua Fix, it becomes waterproof and can be painted over. For many years, more conventional watercolor artists combined brushwork with color and tone to represent a specific texture, such as that of grass, stone, or pebbles. This created visual texture, while the surface of the paper remained completely smooth. Today, more and more artists are using salt, alcohol, and natural sand to create exciting textural effects in their paintings. Some have resorted to acrylic mediums and pastes. However, the plastic film created by the acrylic-based products has never been a satisfactory base for watercolors. Enter Aqua Mediums! This superb range is totally compatible with watercolors, producing amazing results that offer artists much greater freedom of expression. These mediums allow artists to add mixed media style effects such as texture, gloss, and iridescence to their watercolor paintings.